nForce2 Higher tRAS yields better performance and higher overclocks? I jacked my tRAS up to 11 and checked my memory performance and my scores were noticeably higher. One side benefit to this modification is that my memory could be overclocked even higher with no loss of data or stability. So I did up my FSB to 175MHz (cut me a break, I only have PC2700 HyperX) and dropped my multiplier to 12 giving me 2.1GHz, otherwise known as Barton 3000+. This is all at default voltages, too. Im gonna try this and see if I get any effect. If anyone else tries this post the results and all to compare. I`d heard of this before, and as trying to OC today decided to see what figures I get using this TRas. Abit NF-7S Ver 2.0 Bios 23 , Barton2600 xp-m @2.60ghz(FSB 200@13.0x ) 1.95 VCore ,Asetek KT03 kit , 1GB Winbond PC3200 CAS 2.0, Nvidia FX5900 Ultra @478/908 ,2x80gb Seagate Barracuda V SATA RAID 0 ,Creative Audigy 2,Sandra PR3528,3Dmark v3.04 6106.WinXP Pro Sp1 5.1.2600. Prime95 stable. Here`s my system specs ..I`m very pleased with the RAM speeds ! I bought generic Winbond CH-5 chips from Ebay for $107 incl. postage (£66) , stuck some thermaltake heat spreaders on them ,and now have them running at 432 mhz @ 10 ,3,3,3 Cas 2.0 with absolute stability ! 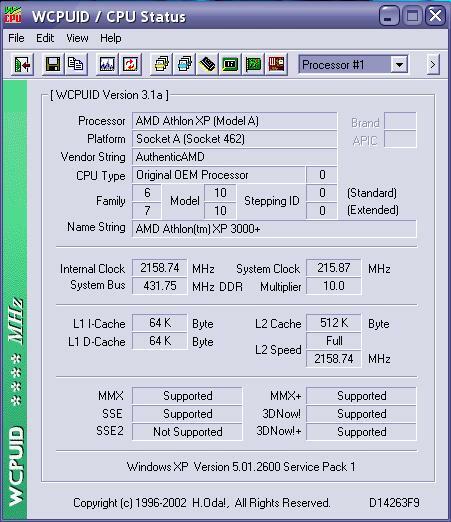 i have winbond memory too, can run them at 460ddr and at 6-2-2-2.....changing to 11-2-2-2 gave me no change in performance. 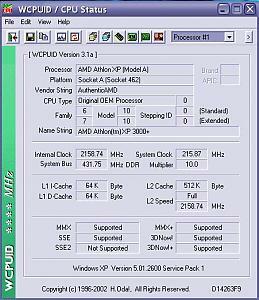 460 DDR ie 2x230 ?? Very impressive , I presume these are PC 3200 chips ? Do u have active cooling on them ,and what is your VDimm ? no heat ? nope thats not true I`m afraid ..put your hand on your RAM chips after a heavy session and yes they do get hot ! 3.15 Volts ? My mobo doesnt have any settings above 2.9v , and its an overclockers one . What mobo are u using ? Just curious , those figures are quite amazing ..can u post a Wcpuid pic of them ? oh and im using an abit nf7-s..... its had the chipset and dimms voltmodded. Thats a very impressive overclock u got there ! I might try pushing some voltages after seeing your overclock, and see if I can crank things a bit further .